In a bright, modern restaurant in west Tokyo, a quiet revolution is being plotted. About 30 vegetarians have met to discuss how they can convince the restaurants of Japan’s capital city to start serving vegetarian food. Tokyo may be the gastronomic capital of the world – with more Michelin-starred restaurants than any other city – but it has lagged behind in catering for those who don’t eat meat. 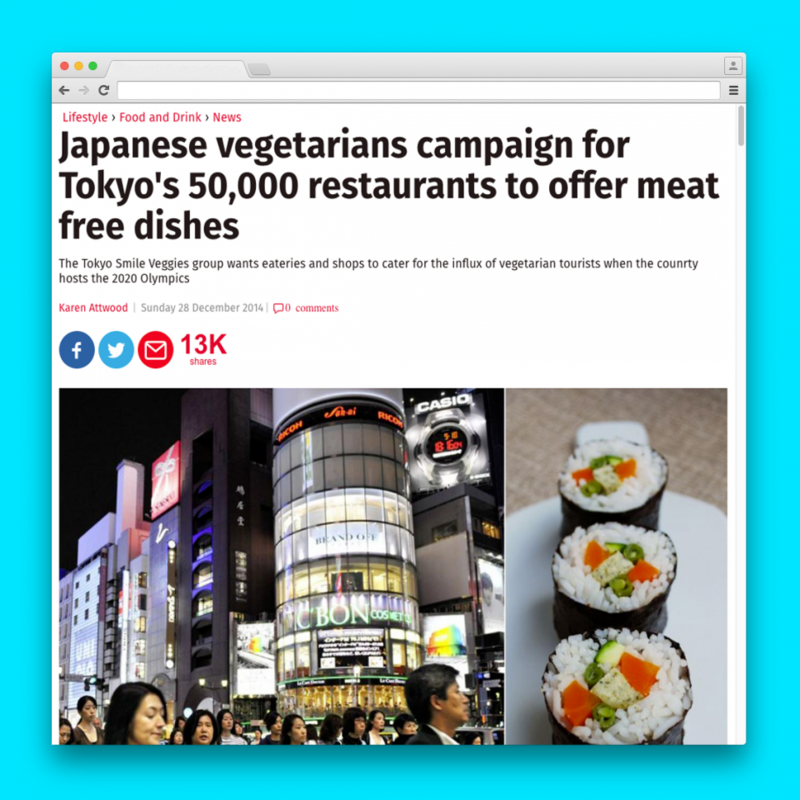 But with Japan hosting the Olympics in 2020, and the associated influx of vegetarian tourists, the group Tokyo Smile Veggies aim to get 50,000 restaurants – the number of convenience stores in Tokyo – to offer vegetarian dishes by the time they arrive. They plan to do this by hosting workshops explaining what vegetarianism means, by offering recipes and training to chefs, and by getting restaurants that are vegetarian-friendly to display signs. Over the past decade there has been a rise in popularity in vegetarian and vegan food in Japan alongside a boom in macrobiotic food, which has led to the opening of about 500 vegetarian and macrobiotic (which serve meat but have many vegetarian options) cafés and restaurants, according to Tokyo Smile Veggies. The macrobiotic trend started not long after Madonna appeared on the Japanese show Smap Smap in 2006 hailing her macrobiotic diet, according to the owner of one restaurant. Historically, Japan does have a tradition of vegetarianism. Buddhists are banned from eating flesh and some of the tastiest vegan food in the world “shojin ryori” is eaten at Buddhist temples across Japan. Patricio Garcia de Paredes, a macrobiotics teacher from Spain who lives in Yamanashi prefecture, west of Tokyo, travelled to the capital for the meeting. “Japanese chefs are very good at cooking with vegetables, but they think their customers just want meat,” he said.